Chip the Stuffed Chipmunk by Aurora has been storing up love and he is ready to share it with you. Our plush chipmunk will plant seeds of joy in your home just like real chipmunks help spread seeds in the forest. Chip the Stuffed Chipmunk has mostly brown fur with a white belly and black, white, and gray stripes on his back. Chip measures eight inches long and has little black eyes. A member of the Aurora family, Chip the Stuffed Chipmunk is made from high quality child safe materials and meets or exceeds all U.S. safety standards. 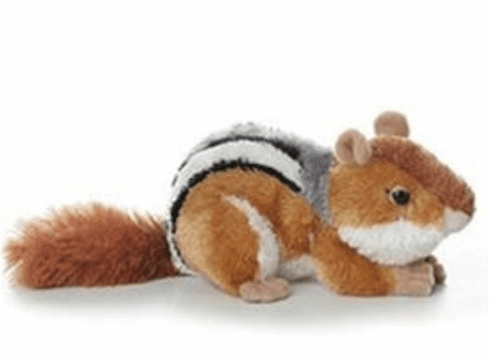 Recommended for ages 3 and up, Chip the Stuffed Chipmunk is surface washable.